It’s no secret that I love fat. (See today’s dueling post on homemade butter.) And it’s no secret that I love chicken, as evidenced by the hundreds of poultry recipes on this site. 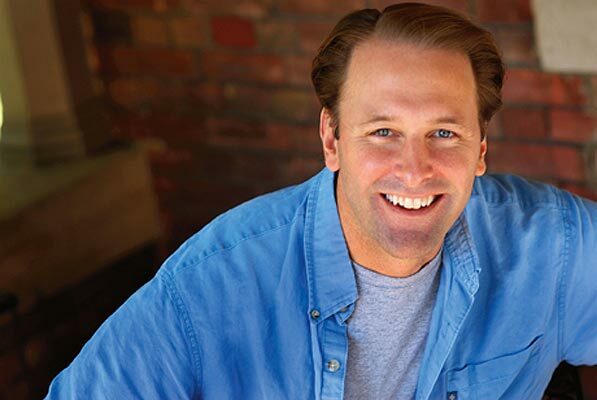 So Renee and I were more than a little pleased when food writer, author, and very vocal advocate of good food and home cooking Michael Ruhlman joined us for a podcast chat about the his newest treatise, The Book of Schmaltz: A Love Song to a Forgotten Fat. For years, Michael has been clarion-clear about what he calls “America’s wrong-headed fear about fat.” And he’s finally proven that deep down we’re not so knee-knockingly, nail-bitingly terrified about fat with the resounding success of his earlier book, Charcuterie: The Craft of Salting, Smoking, and Curing. Ditto for his follow-up, Salumi: The Craft of Italian Dry Curing. People want fat. And they want it bad. 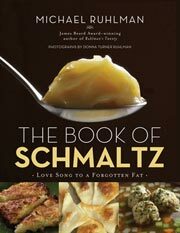 The Book of Schmaltz continues his quest to demystify the craft of cooking with fat. As he explains, his neighbor, Lois Baron, was about to make schmaltz for the Jewish high holy days (which, coincidentally, begin today), and…well, suffice it to say, in that chance encounter, he found his teacher and mentor. In both the book and the podcast interview, Michael takes us, step by step, through what schmaltz is, how to render it, how to store it, and how to indulge in it, including 20 recipes, both classic and contemporary. He also enlightens Renee and me about the existence of gribenes (pronounced GREE-bin-iss), those wonderfully crisped bits of chicken skin that are left after the fat-rendering process. Think chicken cracklings. And he divulges ways to indulge in gribenes, including eaten out of hand, just like popcorn. Mixed into mashed potatoes. Slipped into matzoh balls. And just about any other way you can imagine. But it wasn’t until Michael proclaimed that schmaltz (which can be made from any poultry—whether duck, goose, even turkey) can even be used in baked goods that I was gobsmacked. Yup. That’s right. You can fashion pastry made with schmaltz and use it to cradle your chicken pot pie. Can you imagine? Oy. Photo © 2013 Donna Turner Ruhlman. All rights reserved. All recipes and photos used with permission of the publisher. Last week I rendered 6 pints of schmaltz and fried up 4 huge onions in the bubbling fat until they were like the color of gold. I drained them off and saved them. I put up the schmaltz and froze it. Yesterday I made 7 pounds of chopped liver using almost one jar of schmaltz and 1 cup of the onions….lots of salt, pepper, fresh garlic, raw onion, sugar to counter the bitterness of the liver and one dozen hard boiled eggs. Today I re-seasoned it and put it into its final serving dish. Also happened to bake up NYC Style Caraway Onion Rye Bread to serve it with. The schmaltz also went into the 100 potato knishes that will be served tonight. The brisket did not need schmaltz, but, I did leave the fat cap on when I roasted/braised it. I have a cardiologists telephone number handy. Happy New Year to those to whom it matters, and to those to whom it doesn’t, have a happy and healthy fall and winter season. Stu, I fell off my chair and hit my chin on my desk on the way down after reading your comment. I am utterly, 100% jealous. It all sounds so wonderful. Especially the chopped liver. Where did you get all that chicken fat? Stu—you have very lucky family and friends. Wishing all a Schmaltzy Happy New Year. Thank you, David and Renee. You’re so very welcome, Donna. We should be thanking you, it was such a pleasure to have you and Michael in the studio. Loved today’s podcast. Thank you. Why, thank you kindly, missy. Thank you kindly.